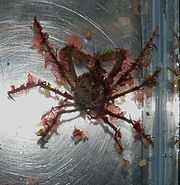 Oregonia gracilis, commonly known as the graceful decorator crab, is a "true crab". It often decorates itself with objects from its surroundings in order to blend in with its natural environment. This form of crypsis is used to avoid predation. Because of this crypsis, it can be difficult to spot in its habitat. They belong to the order Decapoda, meaning they have 5 paired pereopods (thoracic walking legs) and the first 3 pairs generally assist in feeding and are called maxillipeds. Like most crabs, the first pair of pereopods have pincher-claws and are called chelipeds, which are usually for feeding or defense; O. gracilis also use these claws to decorate themselves. The abdominal segments each bear a pair of appendages called pleopods that function to generate respiratory currents and brood offspring. This species has a carapace covered with larger, more distinct spines and chelae are tipped with white not orange. This species is found at depths below 500 m.
This species has shorter, flatter rostral horns and shorter, less spider-like legs. For most of its life cycle, O. gracilis lives solitarily, except during breeding season. While courtship behaviors have been reported, it is believed that chemical cues play the most significant role in mate acquisition. Using its chelipeds, O. gracilis cuts and grasps small pieces of food that are pushed passed the maxillepeds and inward to the mandibles. While the mandibles hold the food, the maxillae rip the food into smaller pieces. Finally, once the food pieces are small enough, they are passed through the mouth for digestion. 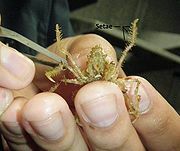 Chelipeds of O. gracilis are not built to crush shells or strong exoskeletons, but are used to pluck soft, small marine organisms and to scavenge the sea floor. As zoea and megalopa, they are mostly carnivorous and most likely feed on smaller zooplankton. Octopus, sea otters, and multiple species of fishes feed on adult O. gracilis. As zoea and megalopa, O. gracilis join the complicated trophic food web of the epipelagic and are most likely consumed by larger zooplankton and nekton. Oregonia gracilis decorates by cutting small pieces of material with its chelipeds and fraying and softening the material with its mouth parts. Once the material is soft, it rubs the material onto its carapace until the material adheres to the setae on the carapace. Individuals will use virtually any material available to decorate themselves to the environment. In captivity, individuals will change their decorations to better match the environmental colors offered. A study from 2009 found males to decorate significantly less than females and for males to decrease decorating with aging more than females. It is thought that individuals decorate less as they age because they are no longer as susceptible to predation with their increased size. As individuals age, they also have less setae present on their carapaces. Individuals were also found to decorate the anterior part of the carapace, near the rostum, most heavily. Anecdotally, individuals tend to decorate the rostrum first. This may be due to the valuable and relatively vulnerable appendages near this area including the stalked eyes and antennae. ↑ 1.0 1.1 1.2 1.3 1.4 Pechenik, J.A. (2010). Biology of the Invertebrates: 6th Edition. Boston: McGraw Hill. ↑ 2.0 2.1 2.2 2.3 Kozloff, E.N. (1993). Seashore Life of the Northern Pacific Coast: an illustrated guide to Northern California, Oregon, Washington, and British Columbia. Seattle: Univ. of WA Press. ↑ 3.0 3.1 3.2 Gotshall, D.W. (2005). Guide to Marine Invertebrates: Alaska to Baja California 2nd Edition (revised). Santa Barbara: Shoreline Press. ↑ 4.0 4.1 4.2 4.3 4.4 Lamb, A. and B.P. Hanby. (2005). Marine Life of the Pacific Northwest: A photographic encyclopedia of invertebrates, seaweeds, and selected fishes. British Columbia: Harbour Publishing. ↑ 5.0 5.1 5.2 Rathbun, M.J. (1925). The Spider Crabs of America.Bulletin 129 of the United States National Museum. ↑ 10.0 10.1 Castro, P. and M.E. Huber. (2010). Marine Biology: 8th Edition. New York: McGraw Hill. ↑ Berke, S.K. and S.A. Woodin. (2009). Behavioral and morphological aspects of decorating in Oregonia gracilis (Brachyura:Majoidea). Invertebrate Zoology. 128: 172-181. ↑ Hultgren, K.M. and J.J. Stachowicz. (2009). Evolution of decoration in Majoid crabs: a comparative phylogenetic analysis of the role of body size and alternative defense strategies. The American Naturalist. 173: 566-578. This page was last modified on 11 March 2011, at 00:24.